Never let a good crisis go to waste, especially from a guy surrounded by armed security, including weapons that are illegal to sell and illegal to own. “We need legislative action now,” CBC Chairman G.K. Butterfield, D-N.C., said, while mourning the victims of both the Dallas tragedy and two recent deadly shootings by police. Black lawmakers delivered an emotional and sometimes searing plea for gun control Friday in response to the Dallas killings, calling the suspected gunman a “terrorist” and openly weeping at times as they railed against gun violence. Rep. John Lewis, a civil rights icon who led a sit-in for gun control measures on the House floor just two weeks ago, as well as Rep. Robyn Kelley, wept during the news conference called by the Congressional Black Caucus on Friday. Rep. Cedric Richmond, a Louisiana Democrat, accused Republicans of “the devaluation” of minorities by not taking up gun control legislation. 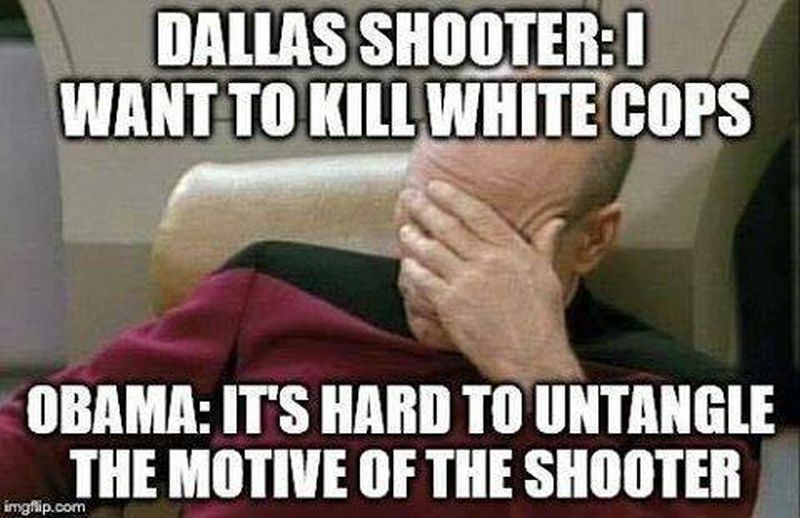 It’s not white people killing white people in huge numbers in Chicago, Baltimore, Detroit, Newark, D.C., and so many other Democratic Party run cities. Once again, let’s note that 50% of the murders in this country are committed by Blacks, a sector of the population that accounts for less than 14% overall. Gun control hasn’t worked among their population. Members of the caucus — including many involved in the House sit-in seeking gun control — said Friday the answer to the Dallas shootings must be new limits on gun sales, increased money for police training, and meetings between local leaders and Justice Department officials. “We are continuing our fight to remove guns from the hands of would-be terrorists and criminals and require background checks for those seeking to purchase firearms. We need legislative action now!” said CBC chairman Rep. G.K. Butterfield. The morning news conference was delayed after the Capitol was briefly placed on lockdown. Except, Democrats are pushing measures that would mostly negatively affect law abiding citizens and their ability to be armed, not criminals. Their plans would violate our 2nd Amendment Rights, as well as our Due Process rights. Furthermore, by disarming regular citizens, they leave them to be prey for the criminals who, surprise, do not follow the law. Double the furthermore, Democrats have supported the groups who smear and defame police offers, who accuse all law enforcement of being “racist” and evil. People who seem to hate white people and cops and use inflammatory and violent discourse towards them. Democrat support for these groups enable the violence. Don’t blame the gun. blame the people who use the gun.